Jacobson’s empty orange juice container will have a far more lasting impact on the world than anything the sales associate has or will accomplish in his lifetime. 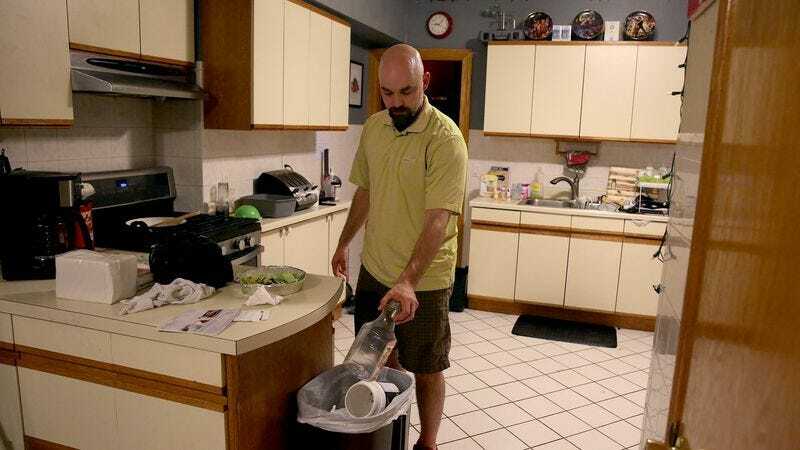 PEORIA, IL—Explaining that the waste he creates today will still be affecting society in significant ways centuries from now, experts from Northwestern University confirmed Tuesday that local resident Aaron Jacobson’s garbage will have a far greater impact on the world than he will. The research team told reporters that, unlike his personal relationships, his career selling inventory management software, and his jigsaw puzzle and euchre hobbies, which will leave only the faintest and briefest trace on the planet, the items disposed of by the 39-year-old will go on to have profound effects on humanity and the natural world for hundreds of generations to come. Researchers noted that while Jacobson has visited a total of just nine U.S. states and one foreign country during his lifetime, the influence of his trash has already spread far and wide, leaving its mark across the globe. Over the past four decades, experts stated, the raw tonnage of refuse produced by Jacobson—a man who interacts with, at most, 12 people in an average week, and whose most recognized personal accomplishment is making pretty good lasagna—has crossed oceans and begun bringing about significant changes in marine ecosystems as distant as Asia, South America, Europe, and parts of North Africa. Moreover, Jacobson’s discarded cleaning products, batteries, and takeout containers will reportedly have a considerable effect on the political landscape, eventually serving as the source of heated policy discussions and debates—even spurring vast movements of entire civilizations—thousands of years after everything the man has ever said or done has been erased from human society’s collective recollection. Seeking to further elucidate just how profoundly impactful the man’s garbage will be in relation to Jacobson himself, experts noted that the Styrofoam packing peanuts that the local resident unthinkingly dumped into his trash can earlier today will still be on earth, altering the environment, dictating wildlife population numbers, and consequently upending food chains a million years from now. By comparison, they pointed out, the man’s years of productive work will effectively pass in the blink of an eye, as will any positive contributions that he makes stemming from his bachelor’s degree in communications, his Microsoft Office Specialist certification, his participation in online Star Trek forums, or any other areas of personal or professional interest where he sought to make a difference.